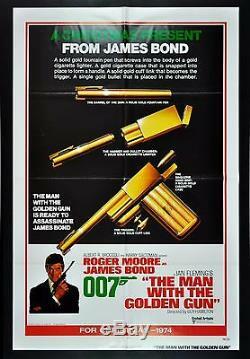 THE MAN WITH THE GOLDEN GUN. 1SH ORIGINAL CHRISTMAS ADVANCE MOVIE POSTER. For 1000's of Vintage Movie Posters. This poster has 1 or 2 extremely minor imperfections. Please examine our extra large images very carefully!! These detailed photos generally speak for themselves. We do not always list every little defect!! We try and list any that we think are important or those that may not be readily visible. We are absolutely certain it is authentic. We use super strong hi-quality packaging materials including thick cardboard, masonite, and costly pvc plastic pipe. (Please see below for details). Unless otherwise specified in the description, ALL POSTERS ARE ORIGINAL MOVIE POSTERS original theatrical movie posters that were displayed or meant for display (unused) in theaters at the time the movies were released. We will put in writing that we guarantee it to be an Original Movie Poster. The item "THE MAN WITH THE GOLDEN GUN CineMasterpieces ORIGINAL MOVIE POSTER JAMES BOND" is in sale since Wednesday, October 14, 2009. This item is in the category "Entertainment Memorabilia\Movie Memorabilia\Posters\Originals-United States\1970-79". The seller is "cinemasterpieces" and is located in Scottsdale, Arizona.